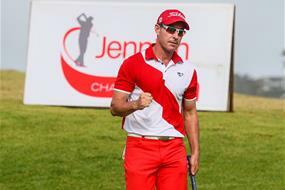 Gareth Paddison has gone back-to-back at the Autex Muriwai Open after a thrilling three-hole playoff against James Anstiss to claim his fifth title on the Jennian Homes Charles Tour. After a long week with no power, the Muriwai Beach Golf Club lit up this afternoon with some spectacular golf, topped off with Paddison sinking a clutch birdie for an exciting and well-deserved finish for the local gallery. It wasn’t his first clutch moment after showing his experience to come back from two-shots behind after Anstiss laid down a great challenge, highlighted by an amazing eagle on the 14th to jump into the lead with three holes remaining. He then added a birdie on 16 to apply huge pressure on the eventual champion who handled it well. With three playoff holes and three impeccable wedge shots, Paddison couldn’t get the final putt to drop, but it was third time lucky as he secured yet another title. “This one means a lot in defending my title, there is a lot at stake and a lot of pride on the line, so it was a great day and I couldn’t be happier,” said Paddison. Paddison will now take this momentum to Japan where he has two qualifying events in a row as he aims to get his Japan Tour card. Anstiss who carded a memorable final round of five-under par, 67 only had positive thoughts after falling just short of a maiden Jennian Homes Charles Tour title. “I’m obviously a bit gutted not to win, but it was an awesome week and I’m pretty happy with how everything went and it’s nice to be up there, right in contention and to have that energy running through the body down the stretch,” smiled Anstiss. Anstiss’s debut event on the Jennian Homes Charles Tour was the Carrus Open in 2014, which will bring back nice memories as he now casts his mind to the Jennian Homes Trophy. This result lifts him into second place and he will now fight it out with Daniel Pearce for the season long prize. Daniel Hillier started the day birdie, eagle to throw his name in the mix early, but couldn’t challenge the leaders enough from there. It still was enough to once again end the week leading amateur as he continues to progress and impress. Oscar Cadenhead and Jang Hyun Lee were tied for lowest round of the week (66) which earns them a share of 52 dozen Asahi. However, with Lee being just 15-years-old, he is unable to accept this which naturally put a large smile on Cadenhead’s dial.